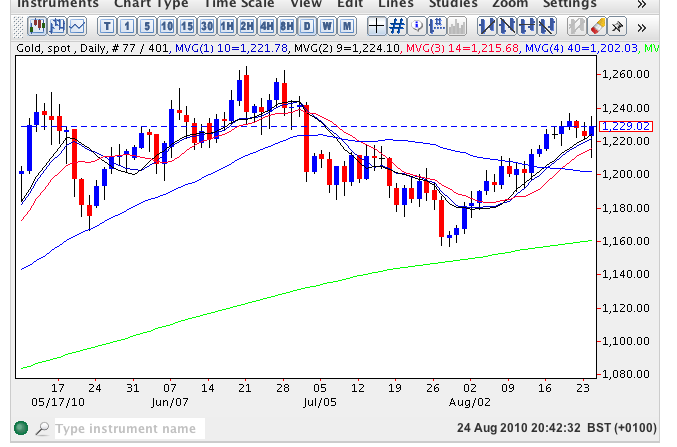 Spot silver rebounded higher today, having initially tested support at the 200 day moving average only to recover in later trading and move sharply higher to currently trade above all four moving averages once again. This reversal of the last few days followed yesterday’s doji cross candle which suggested a potential turn once again and, coupled with the 200 day moving average immediately below, has duly delivered the anticipated reversal higher. Despite this bounce higher spot silver continues to trade in a narrow range between $17.50 the downside and $18.75 to the upside, a price pattern that has persisted since late June. For a longer term trend to develop we need to see a breakout to the upside above $18.75 and beyond and, once this has been established, then expect to see the development of a longer term bullish trend as a result. The 200 day moving average continues to continues to signal that the eventual break will be to the upside and, as such, we have to be patient in trading spot silver.